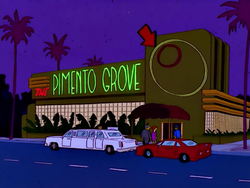 The Pimento Grove is a fine dining restaurant in Springfield. It is the restaurant of choice for many local and visiting celebrities. There are framed photos of many of them lining the walls of the dining room, with the exception of Troy McClure's, which hangs over the kitchen's cat door. Modified on February 26, 2017, at 13:38.